Hi @dteare - I've removed the extension and installed it again, and in each browser / profile that seems to have fixed that problem for me. Many thanks, and good luck figuring out the "why"! @mhl20: Thanks for the update! Glad to know that helped. I think @dteare likes a good puzzle, so hopefully he'll have some fun with this one, but the data point helps. We're here if you need us! Hi, same for me. Occurs at different sites, no network errors, no errors in site console. @haskel: Thanks for getting in touch! We have some improvements in the beta that should help with this. Would you be willing to give that a try? I've only tested this on one machine, so I don't have a large sample size. However, when using the Duo integration, if the "Remember Device Authentications" is left at zero (or blank), then this error comes up. I've been able to reproduce it many times. As long as the "Remember Device Authentications" is set to 1 or higher, then all seems to work fine. @itgjc: Sorry about that! It isn't supposed to be possible to set it to zero, as you'd then need to authenticate over and over and over (you get the idea) again. We'll get that fixed. This happens at random times to me as well, and sadly, I haven't been able to figure out what's causing this. But the good news is that, trying to lock the extension and enter the master password again fixes this. @arunsathiya: I'm sorry for the trouble. We're looking into it. When you get the error, can you check the logs and tell me what it says there? 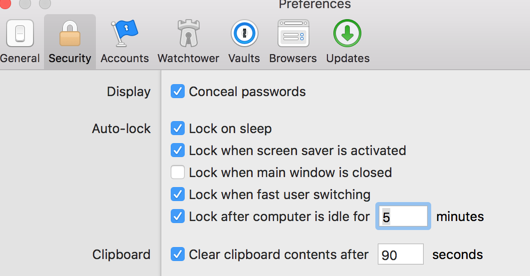 Under 1Password X, click "background page"
Click "Debug" underneath "1Password X - Password Manager"
That may help us narrow down the cause. Thanks in advance! @Swishy888: Glad that helped! 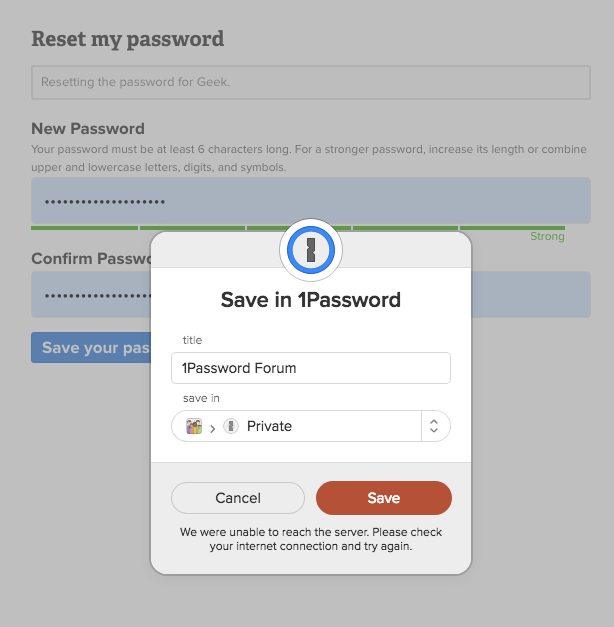 Did you by any chance make some account changes since you setup 1Password X with your account? 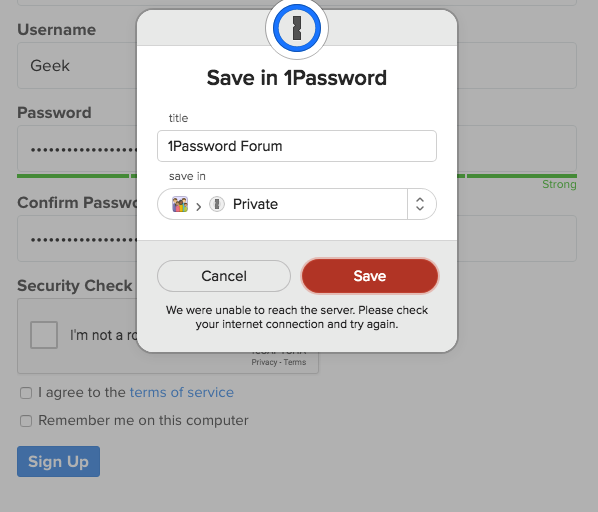 I just installed 1password and i am having this issue on Firefox. I can't save any password. Please help me with this as i am on my trial period. @tzic: I'm sorry for the inconvenience. There is no 1Password X beta for Firefox currently, which would help with this issue, but once we release a new stable version you'll be updated automatically. In the mean time, you can either use the 1Password X beta in Chrome or the 1Password.com web interface if you need to manage your data in a browser. And hopefully it won't be long before the next update either way. Having the same issue here, especially when using Proton VPN. Very frustrating, since I need my VPN on at all times. This limits me to use 1P, unfortunately. Will try beta now and report back if it helped. Do I need a membership for the BETA? I'm happy to learn the beta helped. If you run into any issues please let us know. @felixfbecker: Doh! Can you grab the logs next time it happens? @boberonicus: Version 1.11.0 stable was released yesterday for both Chrome and Firefox. Have you tried that? Issue is back again. Beta. I'm running into this issue again as well. I had been using Firefox 1PasswordX 1.10.3 when I noted this problem. I deleted that and installed 1.11.0 per your suggestion. This fixed the problem for me. I spoke too soon! Put my laptop to sleep, opened it up, and had the "unable to reach the server" message for a different web site. So this is still an issue in 1.11.0. The lock/unlock trick didn't work either. Bummer! Well poo. I had hoped we nailed all of these issues. We certainly fixed many of the root causes of this problem but it looks like we missed at least one. It's time to start debugging this and see where it takes us. Please collect your console logs from the background page and share those along with your browser and 1Password X versions. Oh, I forgot to add something @bcatubig & @boberonicus: when you attach your logs, please include your automatic lock settings as well. They're likely key to unraveling this mystery. The way I managed to recreate it was to completely disable Autolock in Settings and then put my MacBook Pro to sleep for over 30 minutes. When I came back I was unable to save new logins. I needed to lock 1Password and unlock it again to make it work. Is this the same setup you're using, @bcatubig & @boberonicus? Since my last post, I've been trying to recreate the problem and capture a log for you with no success (no "unable to reach the server" messages). Having used the product half-assedly to memorize a handful of my own low-quality passwords since 2008, I decided to go all in and actually give myself over to the product's auto-generated passwords (thanks ransom email!) So, I have over 900 logins to edit/delete/change. I'll keep banging away and post something useful if/when I hit it.